International day of the world’s indigenous people’s was celebrated by ECDO on 9 August 2018. 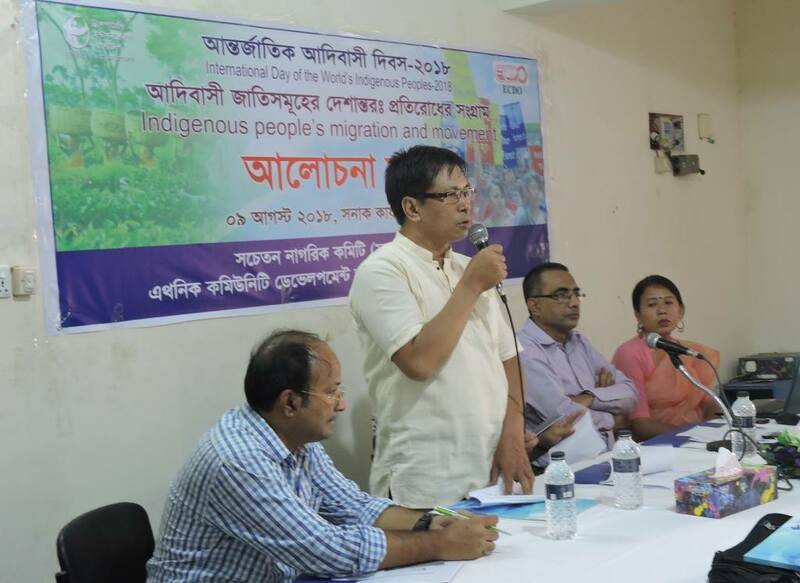 ECDO celebrated this event with theme of ‘Indigenous Peoples Migration and Movement’. 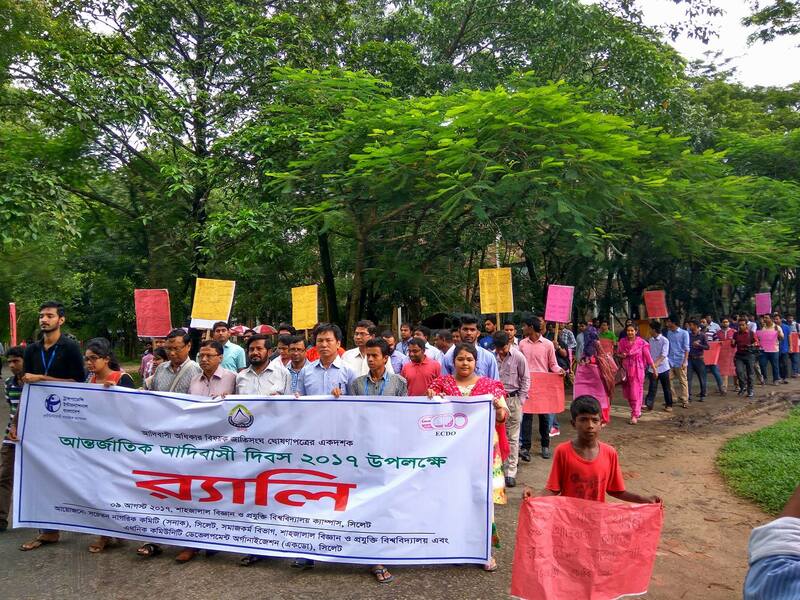 On the occasion of this event ECDO organized a colorful rally in the morning in Sylhet city with the active participation of different indigenous people’s organization and local civil society members. 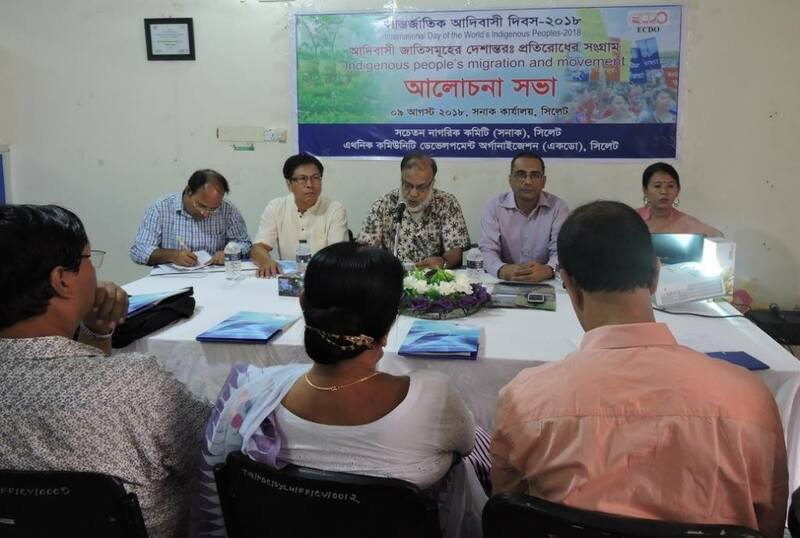 And in the afternoon, ECDO jointly organized a discussion session with the Committee of Concern Citizen (CCC) of Transparency International Bangladesh (TIB) at CCC Sylhet office. The discussion session was presided by Mr. Aziz Ahammed Selim, senior journalist and the chairman of CCC Sylhet. At the beginning of this session Mr. Lakshmikanta Singha, Executive Director of ECDO was delivered a welcome speech. Advocate and ex-president of Sylhet Bar Association Mr. Emad Ullah Shahidul Islam was present as moderator of the session. Ms. Nongpoklai Sinha, Coordinator of ECDO made a multimedia keynote presentation related to the event. In her keynote paper she endeavored to give a present scenario of Bangladeshi indigenous peoples. After her presentation the floor was open for the audiences. Most of the participants were urging to the government not to ignore indigenous peoples rights to ensure good governance in the country. Further they said the government should give more attention on the issue of indigenous people’s rights and development. Because, now the indigenous peoples are marginalizing day by day due to unable to adopt with rapid urbanization process. As a result they are gradually displacing from their ancestral land. On the other hand some of the local political leaders are also trying to grab indigenous peoples land. For that reason now some indigenous groups like Patro, Oraon, Dalu etc. in Bangladesh are living in an endanger situation. Considering the above situation most of the speakers urging to the government to pay special attention to the plain land indigenous peoples. To increase the fund of Special Affairs Division (SAD) under Prime Minister’s office. To establish a separate institute for indigenous peoples in Sylhet city. Finally to recognize ‘indigenous peoples’ in our Bangladeshi constitution. ECDO has distributed education materials among the Manipuri, Patro and tea labor students through organizing four different programs. The programs were held at Alaibahar and Lackatoorah tea estate for Education Support Centre (ESC) students in Sylhet district and the program for Manipuri Language Centre (MLC) students’ held at Bhanubil Majhergaon and Mongalpur under Moulvibazar district. On 10th July in Sylhet Md. Abdul Muntakim, Assistant District Primary Education Officer (ADPEO) was present as chief guest. Mr. Dilwar Hussain, chairman of Khadimnagar Union Parishad (UP), Sylhet, Mr. Lakshmikanta Singh, Executive Director of ECDO, Raju Goala, President, Bangladesh Tea labor Union Sylhet valley were present as special guest in the program. The above education materials were provided to sixty indigenous students. And the program was held on 3rd August 2018. And the last two Education materials distribution program were held for Manipuri Language Centre (MLC) students on 3rd August 2018 at Bhanubil Majhergaon & Mangalpur Manipuri Language Centre (MLC) in Moulvibazar district. Mr. Monindra Singha, Member of Adampur Union Parishad, Kamalgonj Upozila was present as chief guest in the program. Mr. Indrajit Singha, Manipuri poet and President of ECDO, Mr. Rajkumar Singha President of Bhanubil Majhergaon MLC management committee, Ms. Nongpoklai Sinha project coordinator of ECDO were present in the program. It should be mentioned that among the ESC students ECDO provides School bag, note book, pen, wood pencil, eraser, ruler, sharpener etc. And for the MLC students ECDO provides Umbrella, note book, pen, wood pencil, eraser, ruler, sharpener etc. ECDO provides education materials to its one hundred fifty students. All students were very happy after getting these education materials and they have committed us to be more attentive in education. ECDO provides this education materials under the project of `Promoting Education and Mother Tongue of Indigenous Children’ with support from HEI VERDEN Norway. ECDO is implementing the second phase of the project. We already finished our first phase of the project very successfully. Four representatives from HEI VERDEN, Norway have completed their documentary on education project in Sylhet. It should be mentioned that Ethnic Community Development Organization (ECDO) is implementing education project with support from HEI VERDEN since January, 2015. 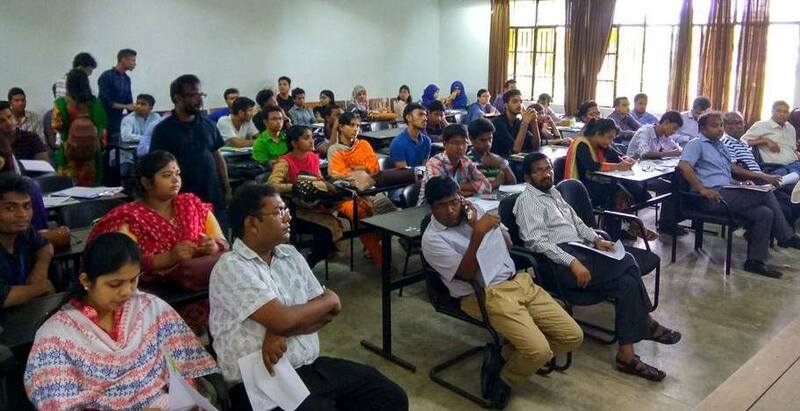 Under this project ECDO is operating Education Support Centre (ESC) and Manipuri Language Centre (MLC) activities respectively in Sylhet and Moulvibazar district. HEI VERDEN has developed a documentary on the activities of this project to share about the education process and environment of Bangladesh to Norwegian children. In this documentary they covered three types of education system in Bangladesh. One is the middle class education system (non government Kindergarten school), the second is semi government school and the last one is fully nongovernmental school of a tea garden run by NGO. To accomplish this documentary they have visited Sylhet Khaanchi Bari International School and College, Raja Girish Chandra (GC) High school, Sylhet and Education Support Centre (ESC) run by ECDO with support from HEI VERDEN at Lakkatoorah tea estate in Sylhet. In the visit team there were Ms. Ingrid Vikse, Executive Director of HEI VERDEN, Mr. Ivar Munthe, project advisor, Ms. Hanne Siri, Director Film development and Mr. Magnus Strand, camera person. During this visit they took interview with concern teachers, guardians, member of school and college management committee, local tea garden authority and others. HEI VERDEN team members thanked to the following authorities The Sylhet Khahanchibari International School and College, Raja G C High School and Lakkatoorah tea estate for giving their valuable time and efforts to accomplish the documentary. 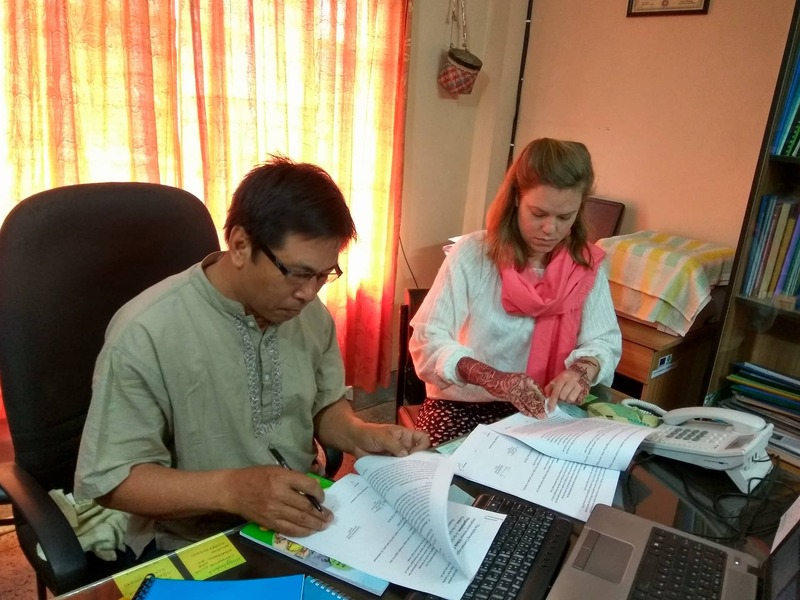 The visit was finished on second March 2018 following by signing a project renewal agreement between ECDO and HEI VERDEN in ECDO office, sylhet. It should be mentioned that the documentary was done under the project of ‘Promoting Education and Mother Tongue of Indigenous Children (PEMTIC) supported by HEI VERDEN, Norway. The main purpose of the project is to ensuring primary education for the poor and marginalized (The Patro, Khasi, Tea labor community) indigenous children and promoting Manipuri language & scripts in Bangladesh. Ethnic Community Development Organization (ECDO) organized the International day of the World’s Indigenous Peoples-2017 in Sylhet jointly with the Social Work department of Shajalal University of Science and Technology (SUST) and The Committee of Concern Citizen (CCC), Transparency International Bangladesh (TIB) on 9th August 2017. ’10th Anniversary of the UN Declaration on the Rights of Indigenous Peoples’ was the theme of the event. On the occasion of the day celebration a colorful rally was arranged with the participation of local indigenous peoples, university teachers, students, human rights activists in the university campus. Then a discussion session was held at Seminar hall of Social work department. And the discussion session was chaired by Prof. Dr. Faisal Ahmmed, Head of Social work department. Professor and Dean of Social Science faculty Dr. Abdul Ghani was present as chief guest. 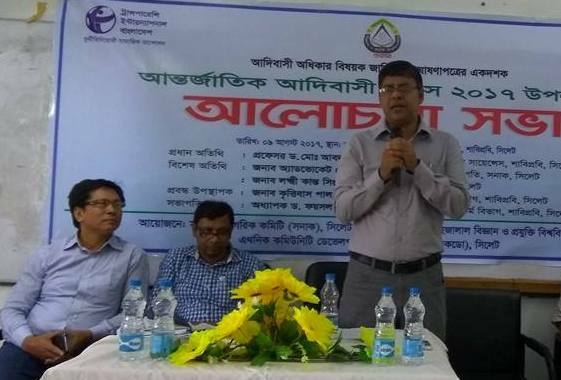 Mr. Lakshmikanta Singh, Executive Director of ECDO, Advocate Irfanuzzaman Chowdhury, President, Committee of Concern Citizen (CCC) TIB, Sylhet were present as special guests.